Which Home Would You Choose? SOLD! The James Sorrell House, established circal 1735. 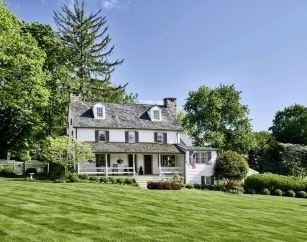 Exceptionally restored and updated, this quintessential Pennsylvania Farmhouse has been a three-time entrant in Chester County Day! Recent renovations (in the last 5 years) include a new cedar roof (with copper gutters and downspouts), two updated guest baths, a new front porch (new foundation and decking), re-pointed stone, and two new furnaces for the zoned heating and cooling system. Adding yet more charm & character to the property is a spring-house with a bell-tower and potting/ garden shed. This exceptional, one-of-a-kind home is looking for the next stewards of its history, who will cherish this home and property for years to come! No historic preservation restrictions, just history to enjoy!